Cumberland Gardens is a small, public, garden area. 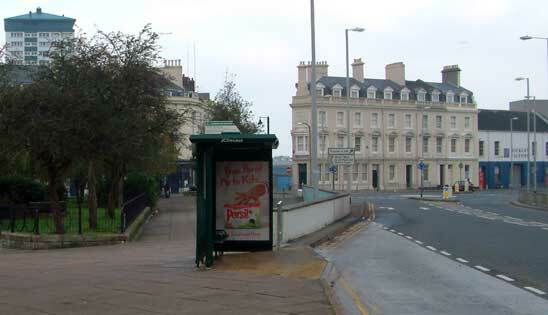 It's located next to the roundabout that joins Cumberland Road with Chapel Street. Image 1. 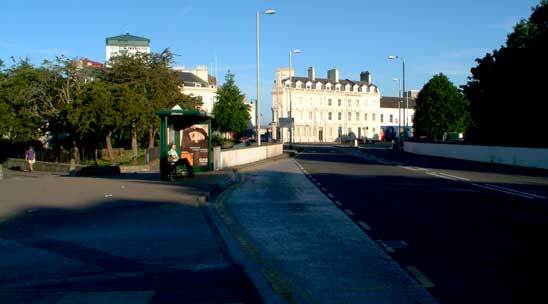 If approaching Cumberland Gardens from Plymouth city centre, you'd be driving (or walking) along Cumberland Road - and this is the first image you'd see. Unless you knew there was a small park there on your left, your eyes would instead be drawn to the stretch of low wall on approach. Image 2. By now almost level, you'd probably spot some type of garden there, but again the low wall blocks the view (as does the bus stop). Image 3 below. 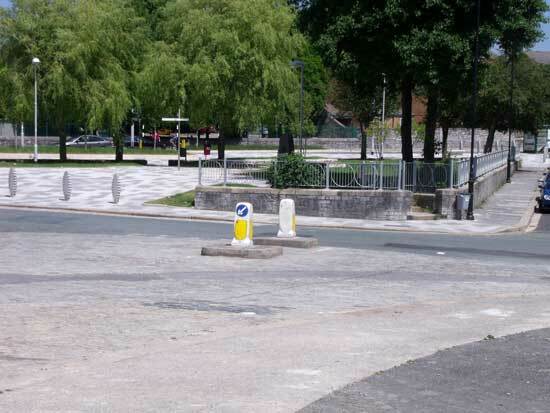 Here is the view a pedestrian would see if approaching the roundabout. Cumberland Gardens would indeed be identifiable as a park space, but not particularly tempting, and it would be clear to the walker that the low wall hides an underpass. Image 4 below is a wider view of the triangle of land that is called Cumberland Gardens. Since it's located at a cross-roads, if it were pleasant to sit in for residents, then think of the vista they'd have - and walkers, and drivers too... If the gardens were made more attractive and the eye drawn more toward their direction, everyone could enjoy the vista. 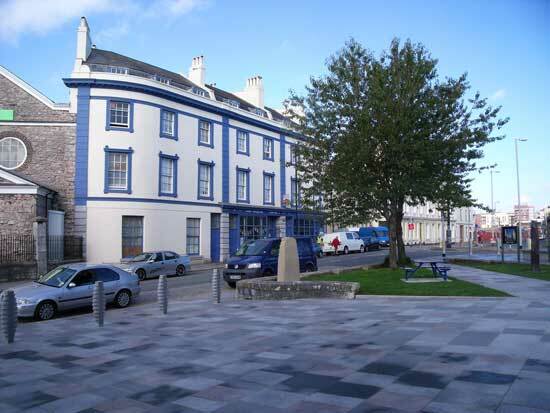 Visitors to Devonport, whether on foot or in a vehicle, would clearly see Ker Street rising up to the Guildhall, at the top left of image. 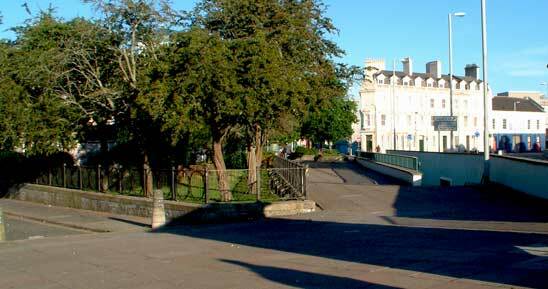 This happy situation will in fact be happening in due course, as Cumberland Gardens is to be upgraded. Image 5 below. 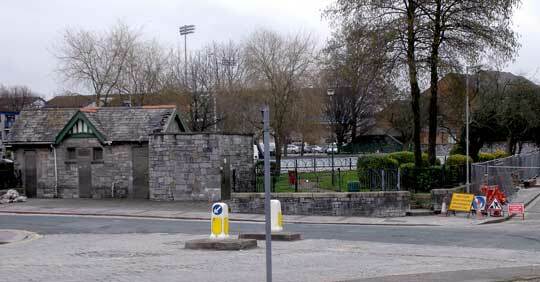 On one side of the gardens currently stands this toilet block, long since closed up. The structure is to be removed, but there will be lavatory facilities available in nearby Chapel Street, in the refurbished St Aubyn's church. 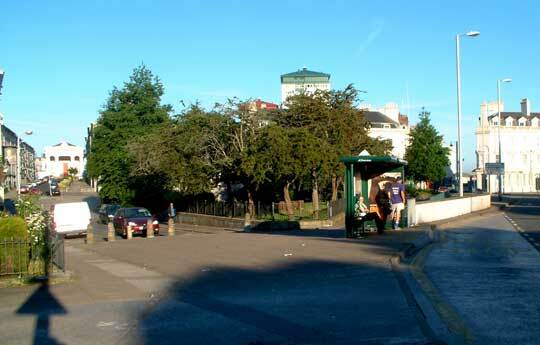 Access into the gardens is not pleasing, firstly because of the railings surrounding the small park; secondly, because of the groups of youths hanging around the entrance and thirdly, it is not laid out to its best advantage, it's not as residents would wish it to be. 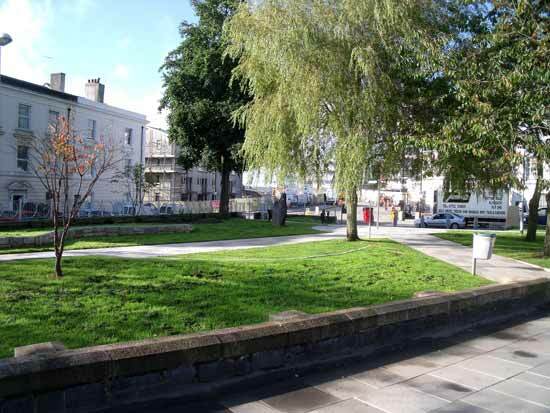 However, following a community consultation exercise new landscape designs were drawn up for the gardens, and the work is due to start during 2010. 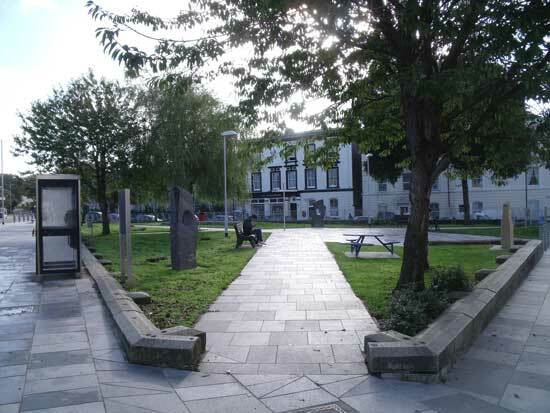 The re-design includes opening up the gardens, laying new paving, installing new seating and adding some public art. Although there are currently trees and bushes at this green space, new trees may be planted. 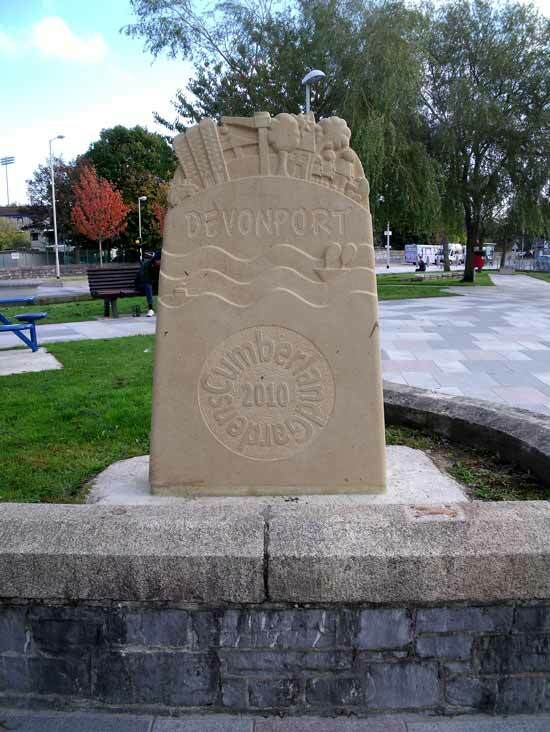 The result should make the gardens more inviting for people to rest awhile, it will certainly be more attractive with the vista opened up, so that persons travelling along Cumberland Road will have great views of both Devonport's Guildhall and the newly-rebuilt Ker Street. 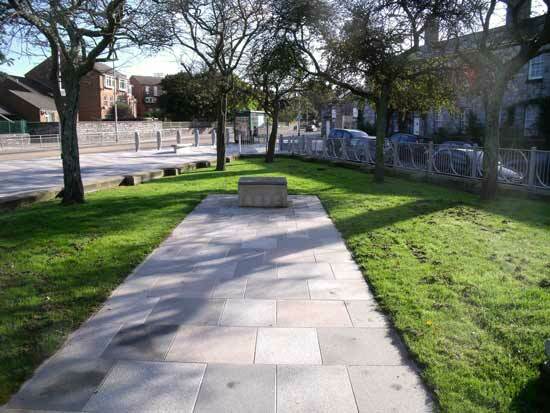 Residents are pleased with the project; the improvement planned for this historic area is well supported. Image 6, below. Taken from the same position as image 5. The toilet block is gone; several residents applied to the city to save the buildng, but it wasn't to be. Beow are more images of the gardens after the work has been carried to. The scene is prettier, less cluttered, more refreshing to sit in, and now contains some artwork.